If you love cheese, this is the recipe for you! This recipe is low fat, high protein, and FULL of flavor! Recipe scaled for 4. If you love cheese, this is the recipe for you! This recipe is low fat, high protein, and FULL of flavor! Recipe scaled for 4. Set oven to 350 degrees before beginning prep-work. Cook jumbo pasta shells until they are nearly done-- al dente. In a mixing bowl, combine cream cheese, cottage cheese, mozzarella cheese, mushrooms and spices. Mix well. With clean hands or spoons, pack pasta shells with cheese mixture. 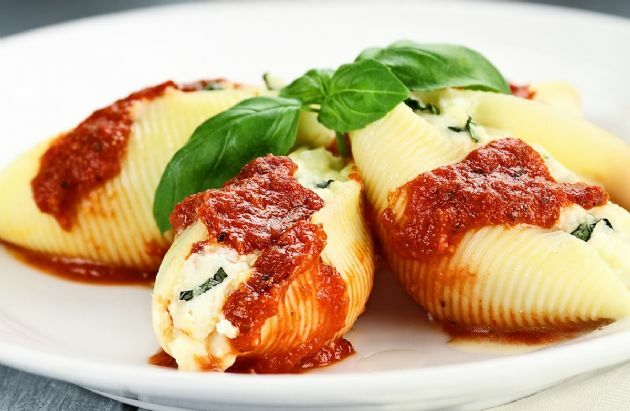 Place each stuffed pasta shell into an oven-safe high sided container. Pour marinara evenly over stuffed shells. Cover with foil and place into oven for about 20 minutes.